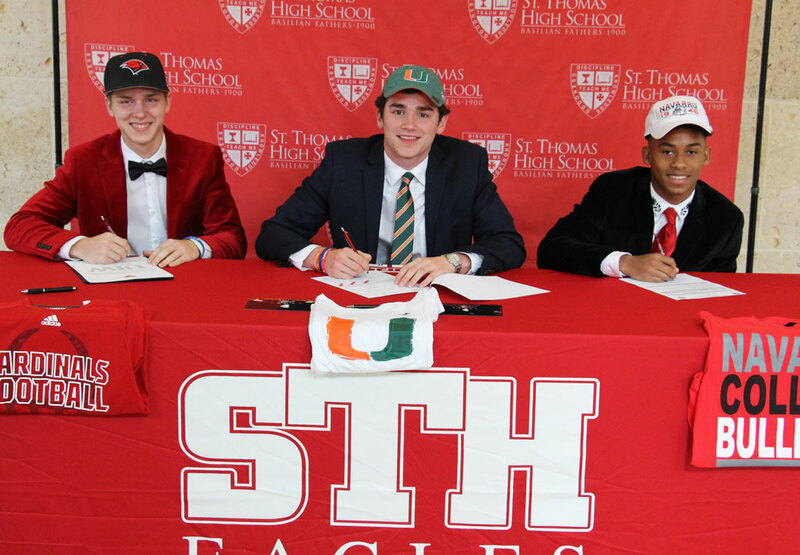 Three essential contributors to the recent resurgent Eagle Football season are the latest St. Thomas scholar-athletes to continue their careers at the collegiate level. 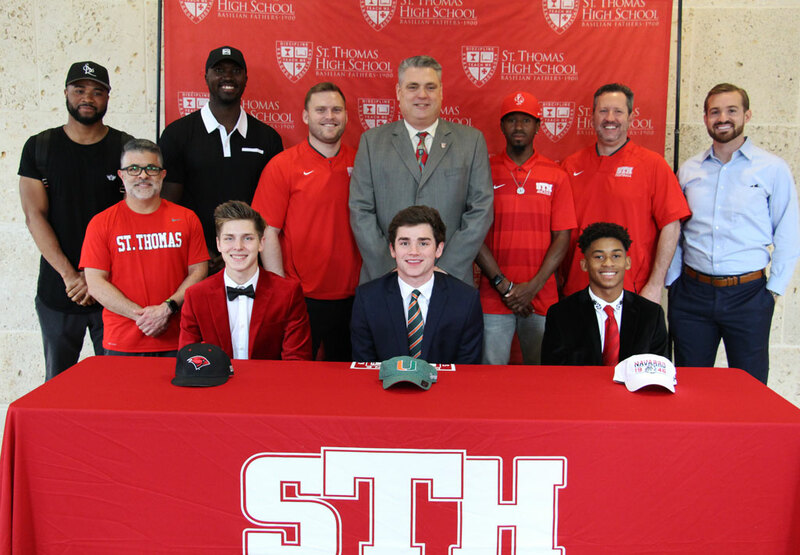 Record-smashing quarterback Peyton Matocha ‘19, reliable receiver Hunter Cheek ‘19 and versatile two-way dynamo Dylan Dixon ‘19 celebrated the February National Signing Day among an enthusiastic wave of family, friends and supporters in the St. Thomas Hall of Honor. 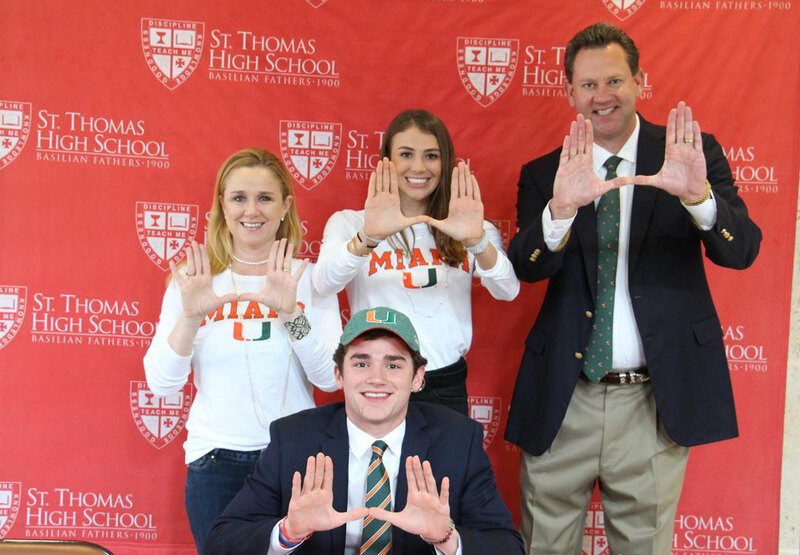 Matocha cemented his recent verbal commitment to the University of Miami. 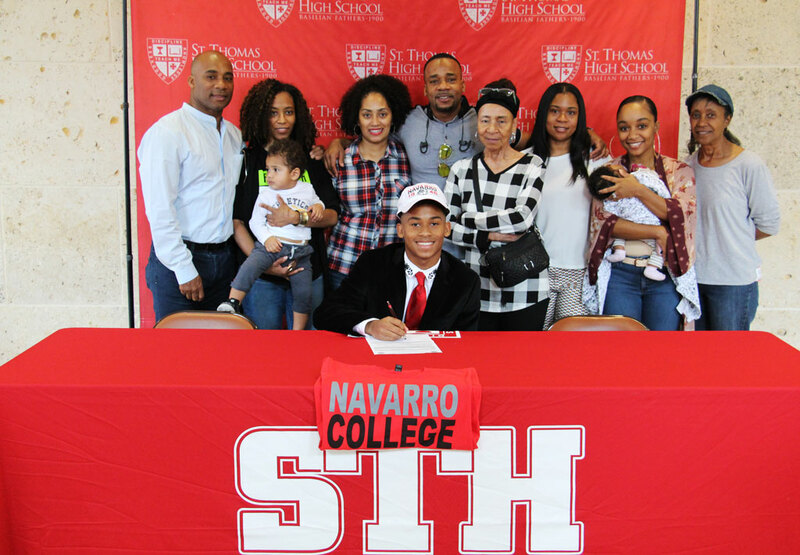 Cheek officially sealed a position with the University of Incarnate Word of the FCS Southland Conference and Dixon to Navarro College. Cheek and Dixon were frequent Matocha targets during the 2018 offensive assault that produced thrills, chills and a robust 42 points per game. They were driving forces in an Eagle revival tour that reclaimed the district title and posted the program’s first playoff victory since 2015 while reaching the TAPPS 6A regional finals. The trio combined for 68 connections and eight touchdowns, including Cheek’s 98-yard catch-and-run against UIL Stafford for the longest scoring play in program history. At midseason, Dixon transitioned to impact a depleted defensive secondary and was nominated by the Touchdown Club of Houston for Ironman of the Year while Matocha was recognized as the private school co-Offensive Player of the Year. 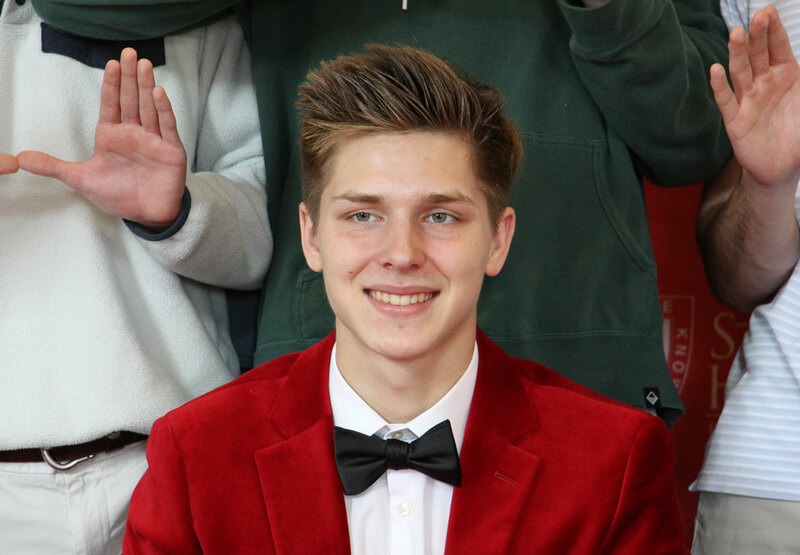 His staggering senior send-off suggested life imitating PlayStation – a single-season school-record 3,697 passing yards with 35 touchdowns plus 787 rushing yards and 14 more scores. Matocha moves on to Miami as the No. 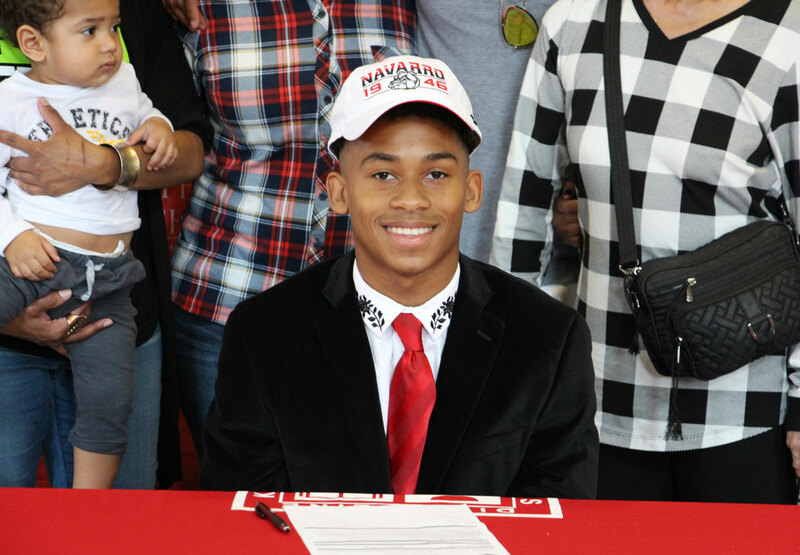 24 dual-threat prospect in the 247Sports composite rankings. The mutual interest spiked late in the recruiting cycle. Two weeks after Manny Diaz was announced on December 30 as the new head coach, longtime offensive guru Dan Enos joined the staff as coordinator and quarterback coach. He spent the previous season tutoring Alabama sensation Tua Tagovailoa into the Crimson Tide’s fourth consecutive College Football Playoff title game and was slotted to become the new offensive chief for Nick Saban with a deep stable of talented Tide game-breakers. Instead, Enos opted to join Diaz in a rebuild at Miami. 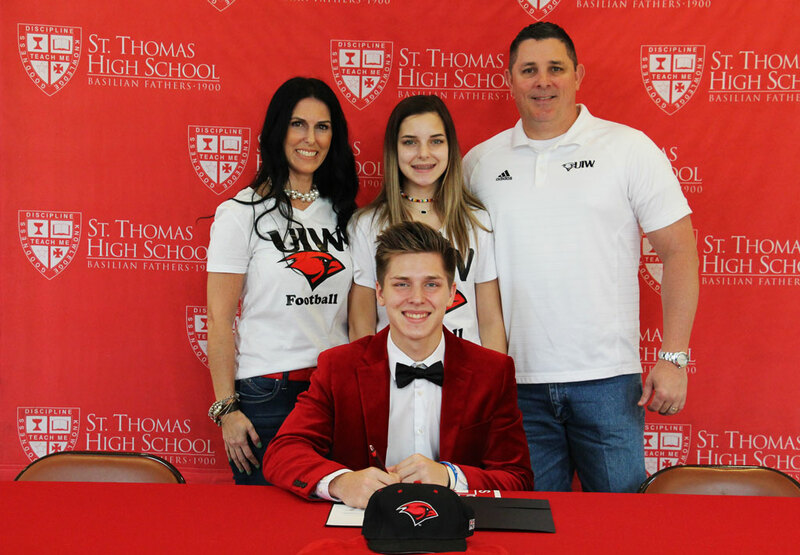 In mid-January Enos quickly connected with Matocha with a scholarship offer. 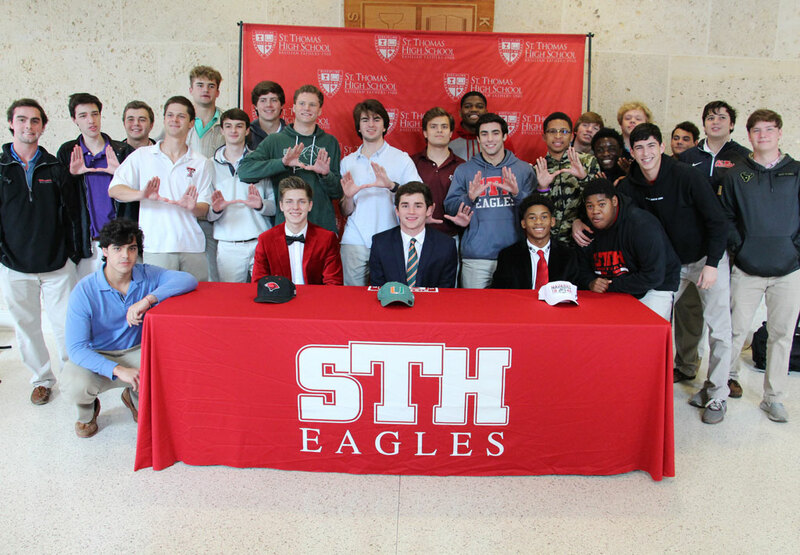 After his official visit to Coral Gables Matocha responded with his verbal commitment to the Hurricanes. Cheek concluded 2018 with 48 receptions for 767 yards and four touchdowns and now somewhat follows his father’s athletic path. Zach Cheek played baseball for UIW in 1997-98. Before the 5-9 Dixon flipped to defense he made 20 catches for 340 yards and four scores. He has embraced the “underdog” role that his mighty mite physique suggests and doesn’t anticipate a change as he prepares to advance to the next level. 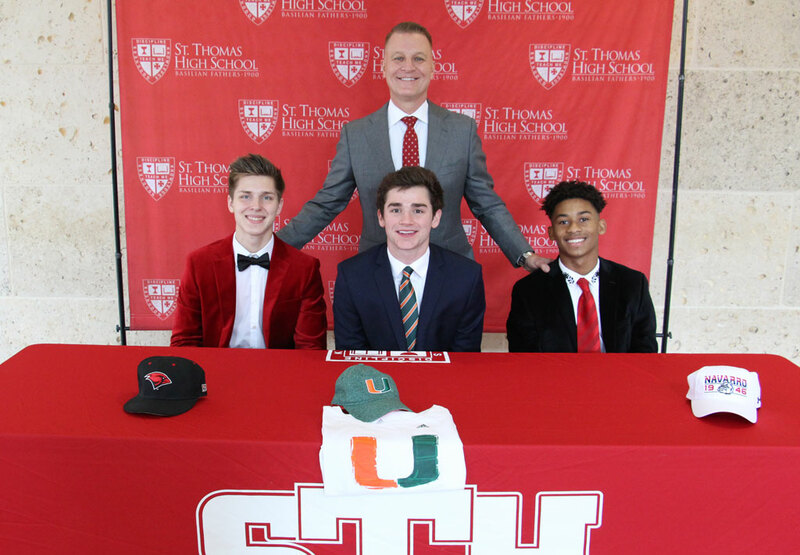 Cheek, Matocha and Dixon add to a rich Eagle athletic legacy – 123 scholar-athletes across nine sports have extended their careers to the college and university level since 2012.